When we made our decision to pursue a low carb lifestyle, this meant almost bypassing the processed food system entirely. When we sought out totally grain-free and healthy carb options, it did not take long for us to discover that the convenience foods which we use to snack on were now a behavior from our past. Finding healthy food options which catered to our on-the-go lifestyle and were grain-free or true good low carb virtually were non-existent in our local food desert. We found that almost all grab and go convenience food are filled with chemical fillers, processed sugar, high sodium & preservatives. What a choice for those who are undergoing an extreme lifestyle change. The low carb snacks we did find online claimed to have "stevia" but it was really mixed with ultra processed corn sugar alcohols, which for us created instant headaches and digestion problems. So we learned to make our own good carb snacks, grain-free bread, and good carb side dishes. As we made it our quest to overcome the inconvenience of making our own food from scratch, we heard from others throughout our market travels who held the same eating challenges as we did for this type of alternative food lifestyles. They too shared the similar convenience food challenges, so we began to explore offering some of our own kitchen creations at our farm market booth. Our passion for creative eating starts in our own home. Eating good carb foods is our lifestyle from the vegetables we grow in our garden beds to the meals and snacks we make in our home kitchen. We researched grain-free recipes . . . diligently hunted down just the right ingredients . . . created some pretty nasty versions of the recipe . . . and when we got the taste and process just right . . . we moved the idea to a commercial kitchen for production. After developing four Good Carb snack products, we presented the new items at our farm market booth in 2017 at the start of the summer season. 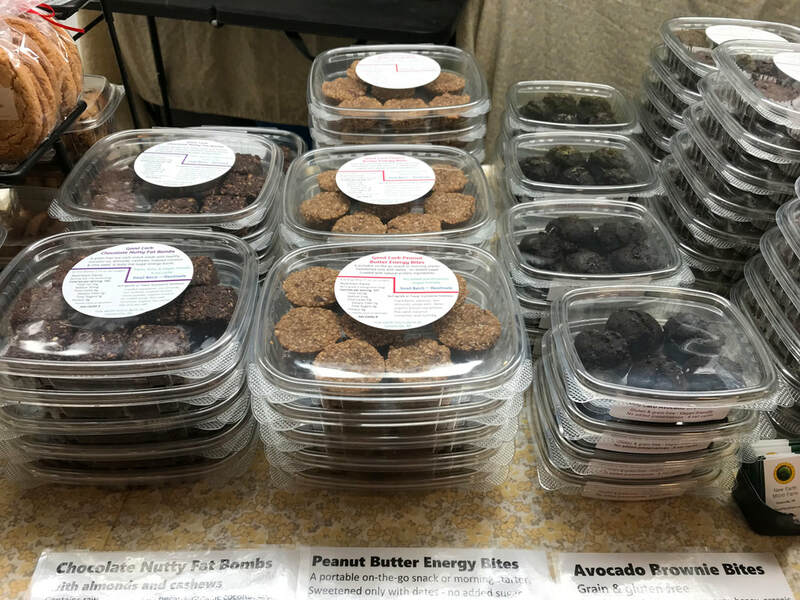 We were humble about making any sales predictions because we felt very intimidated with our "grain-free" snacks competing with hundreds of traditional sweet snacks made by other market vendors. We figured, worst case, if they don't sell, we can freeze the leftovers and have plenty of snacks for us to enjoy for the next month. We didn't need to eat many leftovers for long, as our Good Carb foods began to develop a following at both our farm market booth and at a nearby local market which specialized in homemade take home foods and locally sourced grocery items. Eating has become a complicated process. Many new trendy eating lifestyles have evolved partially due to the increased prevalence of food allergens, along with a personal desire to eat clean and healthy. Even brand name diet programs are becoming sensitive to Paleo, KETO, and Vegan lifestyles in their menu suggestions. When we grocery shop, there are only about a dozen packaged items we buy anymore in the processed food isles, and those items are carefully scrutinized for taboo ingredients. Our greatest challenge to eating grain-free was the absence of sandwich bread and pasta. When the gluten-free trend emerged, there were some bland tasting alternatives that were developed which received a very specialized consumer base. Now, gluten-free is a favored trend for children as well as adults, and many new varieties of bread and pasta have been created using no gluten grains. But for grain-free, the bread choice is limited to a product made with almond flour or coconut flour. These two alternative flours hold the low carb properties that new diet trends, such as Keto, demand. However, producing a fluffy loaf of sandwich bread is challenging without the traditional use of gluten and yeast. 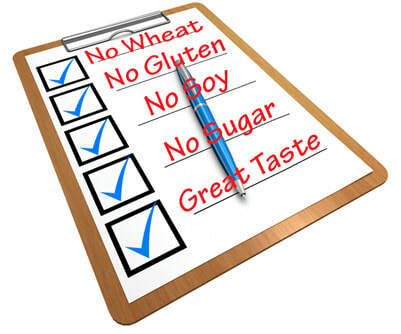 For the record, we ate many bad prototypes of grain-free bread before we perfected the process and ingredients to make a grain free mix that could be appreciated by Keto and Paleo lifestyle consumers. When you are using a flour priced at ten dollars a pound versus white flour that is ninety nine cents, a flopped loaf of bread becomes an expensive baking lesson. Many failed loves of grain free bread became gourmet chicken food for our hens because it either fell apart, was severely dry, or had an uneatable taste. Each failed attempt to make a whole pan of bread with almond flour was a costly mistake and we didn't really find a whole loaf bread recipe we were satisfied with. So for about a year, we gave up on enjoying grain-free bread entirely. When our market season winds down and are vegetable beds hibernate through winter, we have time to create new products. So we did some major brainstorming to develop a quick bread mix we could enjoy with our morning coffee. 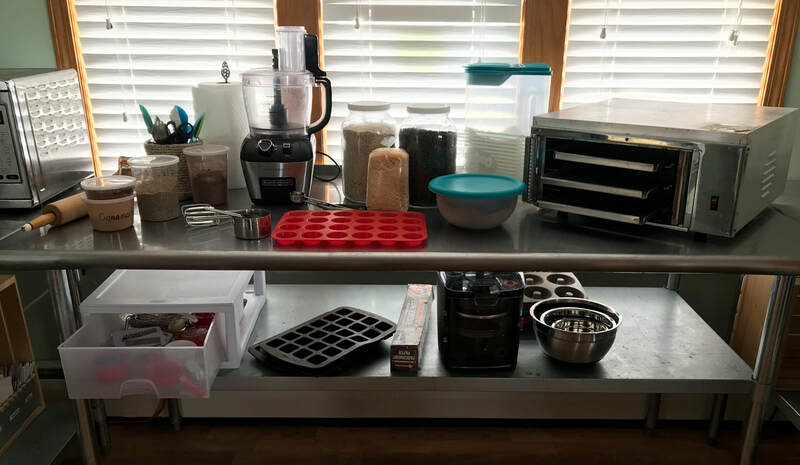 We wanted the product to be super easy to make and be as complete as possible so someone could easily make their snack outside of the home kitchen wherever there would be a microwave, such as an office lunchroom or even while RV camping. Creating the dry mixes as a solution to our own unique foodie lifestyle was the saving factor that keeps us committed to eating grain free as much as possible and makes traveling easier for us. 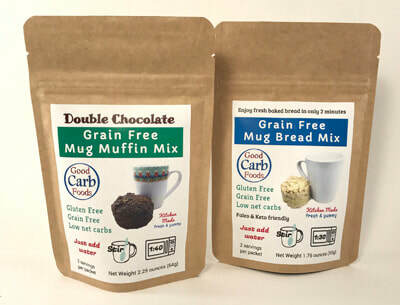 When we finally had a mix that produced a bread and muffin that met our taste and texture specifications, we selected some easy packaging, added a homemade label, and began to test market this new grain-free mix to our market customers. The bread and muffin mix was received well so our next creation was to develop a wrap and pizza base that wasn't filled with heavy ingredients and didn't overpower the taste of the fillings. After many experimentation with different spices and grain free ingredients, we developed a very simple grain free flatbread made with coconut flour and ground flax seed. This multi-purpose mix can be used to create soft flatbread for sandwich wraps and soft tacos. By crisping the prepared flatbread in the oven, this grain free option can also serve as a cracker for dips or as a base for a pizza or quesadilla. Will Keto and Paleo lifestyles become more than just a fad? The popularity of Keto, Paleo, 360 diet, and eating grain free serves many benefits to eliminate health issues and food allergies that have plagued the food system yet went ignored by food producers and farmers. Reducing carbs requires rethinking the dependency of grains and sugars in manufactured food. Many new low carb food products are being marketed as Keto and Paleo friendly, yet still use manufactured sugar as the basis for taste. How a low carb food trend will reshape future diets will be interesting to watch.